I have to admit that I was (am?) an Initial D nut. It wasn’t my first exposure to drifting and cars but it sure pushed me to be a car and driving nut. While I haven’t gotten as far as getting myself my own black-and-white Corolla GTS/Trueno Sprinter/Corolla Levin AE86 and slap on a Fujiwara tofu-ten sticker on the side and drive around like I was a drifting master, I pushed me to do my fair share of rubber burning. It has been 10 years since the First Stage anime came out and 13 since the manga came about and I have to admit that they’ve come a long way since then. And to commemorate the milestone, the franchise will be coming out with the Initial D: Extra Stage 2: Tabi-Dachi no Green. Oh boy, I feel a bit of rush with this one. More cars and since it’s a continuation of the first Extra Stage, babes! Hey, if I remember it correctly, it was in the first Extra Stage that they decided to showcase some renderings of the unclothed female form. 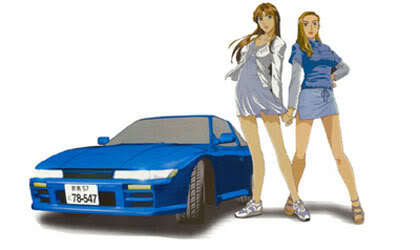 The spin-off sees the reprisal of Mako and Sayuki (the drift pair who ride a Sil-80). The pay-per-view will be shown on October 3 and the DVD will be released on December 5 this year.